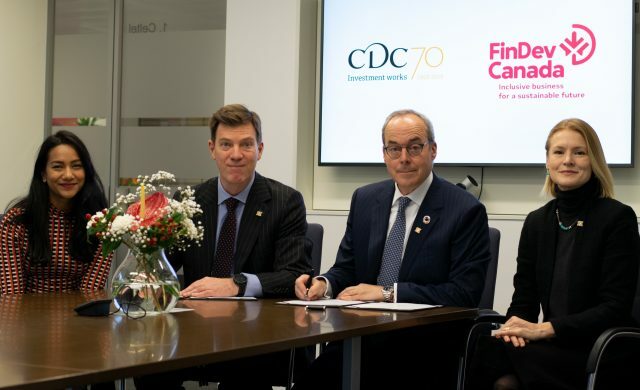 The Development Finance Institutions of Canada and the United Kingdom, FinDev Canada and CDC Group plc (“CDC”), signed a Memorandum of Understanding to further their collaboration to achieve the Sustainable Development Goals. Through this agreement, signed at CDC’s offices in the UK, both DFIs committed to seek joint opportunities to invest in businesses in developing markets with potential to improve key aspects tracked on the SDGs, such as women’s economic empowerment, job creation and climate action. Both institutions share common focus in sectors like agribusiness and financial services, and in the African region. FinDev Canada and CDC collaborate closely to find gender-centric investment opportunities through the 2X Challenge, a commitment with fellow G7 DFIs to mobilize 3 billion dollars towards businesses that benefit women. FinDev Canada recently joined the CDC -hosted Gender Finance Collaborative, that furthers collaboration in gender-lens investing between its 14 participating DFIs. Paul Lamontagne, Managing Director, FinDev Canada; Jen Braswell, Director, Value Creation Strategies, CDC.